This is an excellent book that aims to help moms treasure God and depend on His all-sufficient grace by applying the gospel to motherhood. If you are a mom, or know a mom, please download/share this resource! The cover of Time Magazine asked this haunting question in bold red letters that hung over the startling image of a young mother breastfeeding her four-year-old. When the issue hit newsstands it re-ignited a longstanding mommy war in American culture. But it turns out this was the wrong question, pointing in the wrong direction. There is a higher and more essential question faced by mothers: Is God God enough? This short book by eight women explores the daily trials and worries of motherhood. In the trenches, they have learned (and continue to learn) how to treasure God and depend on his all-sufficient grace. The paradox of this book is the secret power of godly mothering. 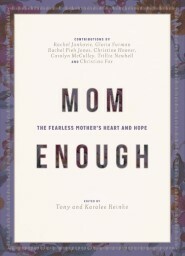 Becoming mom enough comes as a result of answering the question, “Are you mom enough?” with a firm no.